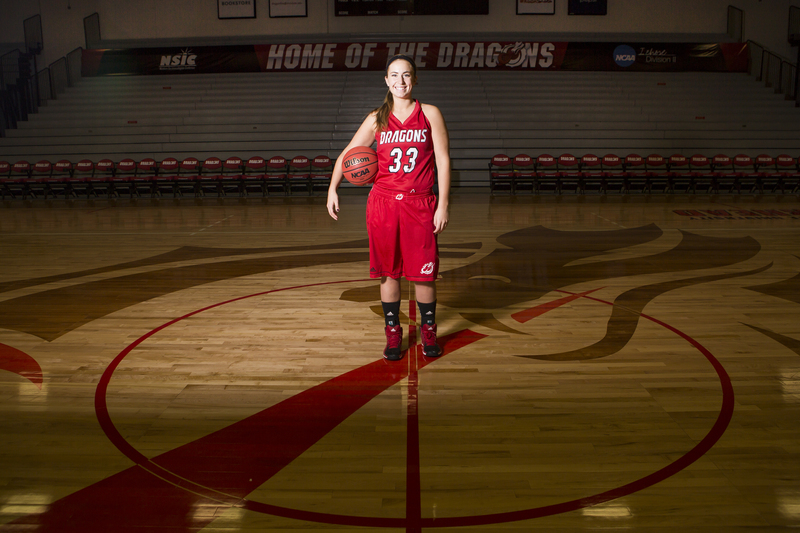 Zabel, a four-year starter for the Dragons, aims to leave her mark on the MSUM women’s basketball program. Women’s basketball senior forward, Morgan Zabel is no stranger to basketball. It has been a part of her life since before she could remember. “My dad was a big basketball guy. He always coached me growing up. My family is very passionate about the sport,” Zabel said. She began playing organized basketball at five-years-old. Growing up, it had always been a dream of hers to play college basketball. Head coach Karla Nelson first noticed Zabel’s skills when she had her try out for the team. Zabel impressed her right away with her knowledge of the game and how well she did on the court. When Zabel joined the team, she brought a certain mentality to the court. She can make plays and make her teammates better. Nelson said any time you get a player that comes in and makes her teammates better, you have something special. But it wasn’t just her great skills that Zabel brought to the Dragons’ team. It’s her work ethic that really makes her a team leader. “There is no doubt that not many people will outwork her,” Nelson said. As a double major in finance and business management, Zabel works as hard off the court as she does on. She said being a three-sport athlete in high school helped her with time management skills. So far in the season, Zabel is the highest scorer for the Dragons with 57 points. She is shooting at .833 percent from the free-throw line, .442 percent FG and .300 percent 3FG. She was recently named MVP of a basketball tournament at Concordia – St. Paul. Zabel said the award was definitely an honor and felt good to achieve. But that wasn’t the first time she had been awarded for her skills. Last season she was named Northern Sun Intercollegiate Conference player of the week, all-conference second team and named to the NSIC all-academic team. Zabel was also second on the team in scoring with 12.9 points per game and shot a team best of 46.2 percent from the three-point line. She said the team aspect of basketball is one of the things she loves the most. Zabel said she loves the friendships that are created and the family feel. The women’s basketball team is off to a strong start in their season, opening with three straight wins. Zabel’s goals for the season are to, first and foremost, contend for conference champions and defend their home court. She said she hopes for the team to continue to get better everyday and play their best in basketball. Zabel and the Dragons open up conference play at 4 p.m. on Saturday when they host Northern State at Alex Nemzek Fieldhouse.